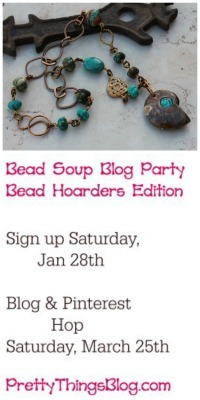 Yesterday I posted about the Bead Soup Blog Party® sign ups being THIS WEEKEND! But you know what? You don't have to wait for your partner announcement to start cooking up your Bead Soup now! You don't need to know who your partner is to make a soup! Why? Because that's the entire point of the party -- to send a mix of quality beads. NOT to send beads in your partner's favorite color, or current style. 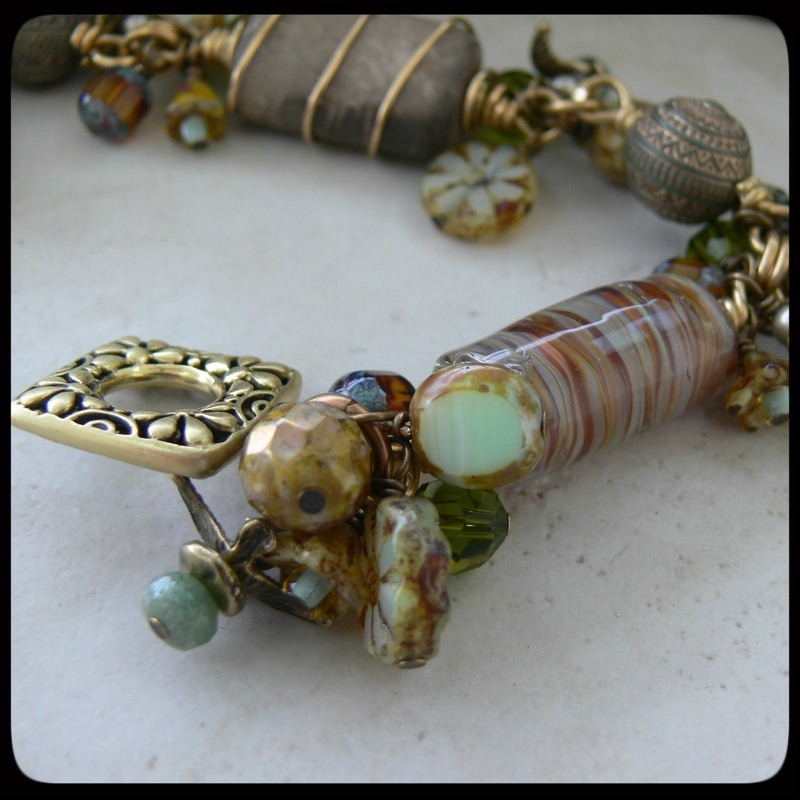 The majority of people receive beads they have either never used before, and that helps expand your design power. When you get your Bead Soup from your partner, dig into your own stash and start seeing what ELSE you may have that works with it, and embrace the challenge. If you are a seed beader, you will have a choice at sign up to choose to be paired with another seed beader. Why? Because seed beading is a skill and art that is almost impossible for a person who has never touched a seed bead or needle to master for a challenge. 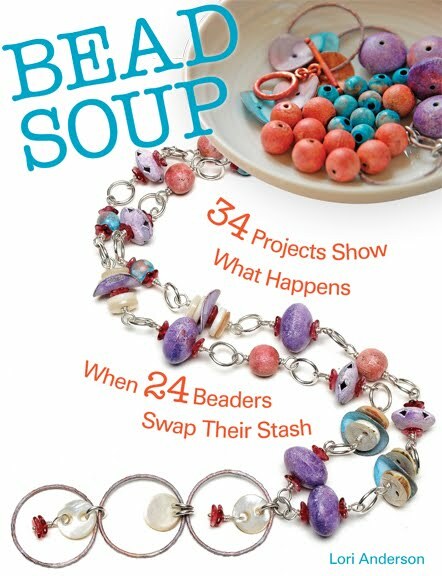 If you are a seed beader who also strings, uses wire, etc, and has the stash to send that sort of Bead Soup, then you can choose to have a non-seed bead partner. 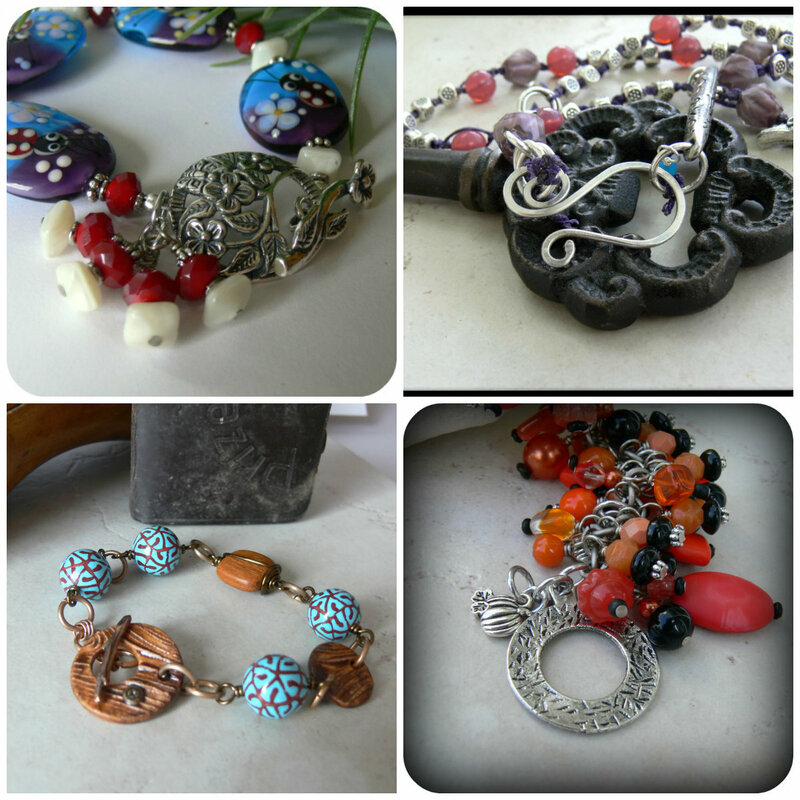 You can absolutely send a seed beaded pendant, beaded bead, and other awesomeness of that sort. to a person who is NOT a seed beader. Bead Soup sent to me by Jennifer Cameron. Some people like to make up pretty packaging for their Bead Soup. That's not necessary, but feel free to show your creativity that way if you like. I'm not terribly creative with paper so I use my jewelry boxes -- still pretty! DO label what you're sending -- what is it made of, who made it (if it's handmade), even where you got it if you know. 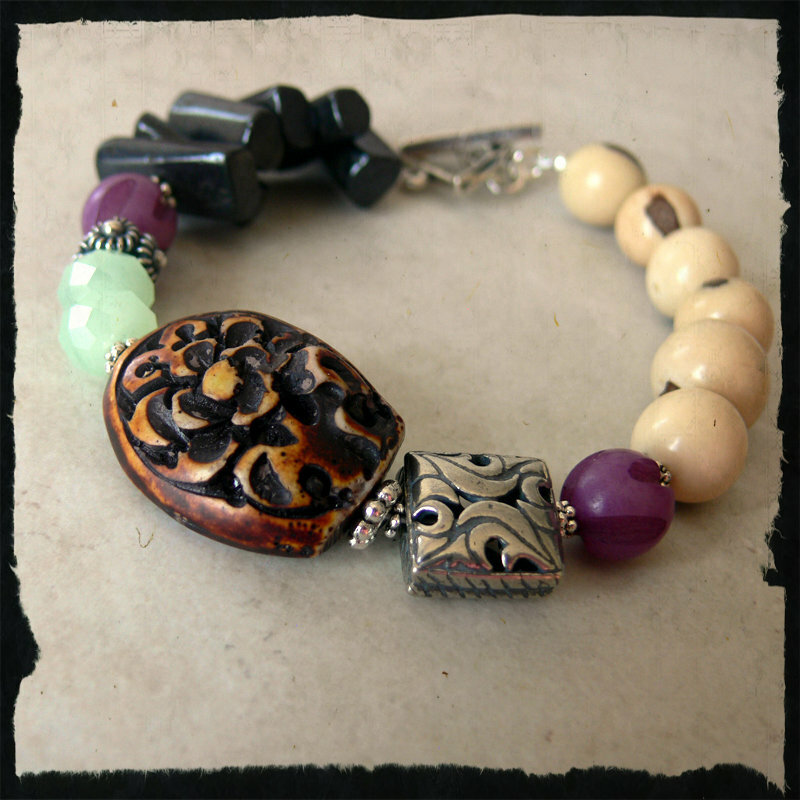 Sterling silver, handmade silver by me, handmade ceramic by Earthenwood Studio, and a pewter toggle. There are so many things you can choose, in any type of metal or composition. What do I mean by a focal? Well, to most people, it translates as a something meant to be used as a pendant. The vast majority of pieces made for past Parties were necklaces. However, you can send a large bead that is special and let your partner know THIS is the focal, and I was thinking it could work for a necklace OR a bracelet. that I chose to use in a bracelet. Carved wood bead I forgot I had. And lastly, you are NOT expected to go out and buy beads for this challenge, but if you would like to, you're of course welcome to. You want to send a quality packet of beads. That doesn't mean send a million, but ones that are special and something you would send your best friend. no religious, political, or similar beads. I hope to see you at sign ups this weekend! 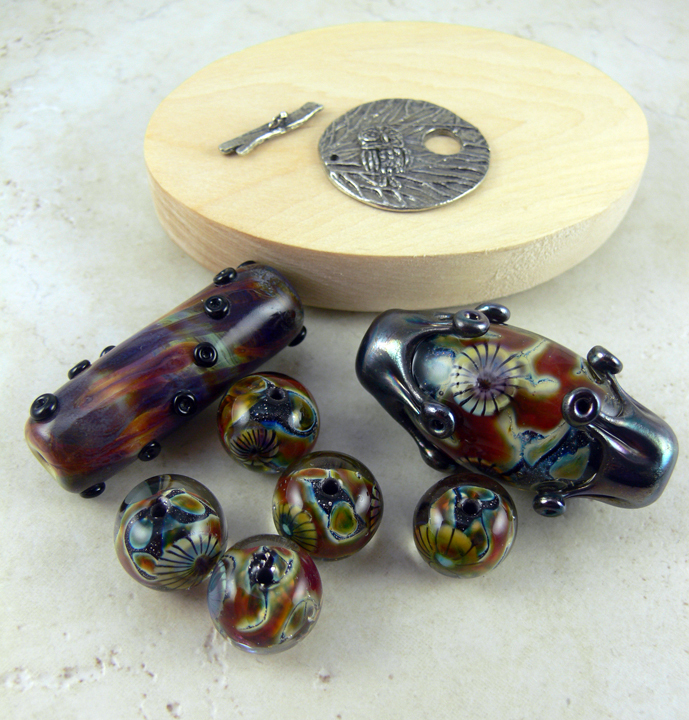 1) Upon receiving the bead soup package, am I required to use ALL of the beads? 2) That produces a second question: if the answer is no, then could I send a few seed beads along with the rest of the beads, so the recipient could use them as spacers, or to make a loop for a clasp, etc.? Send a seed beaded focal that can be strung. 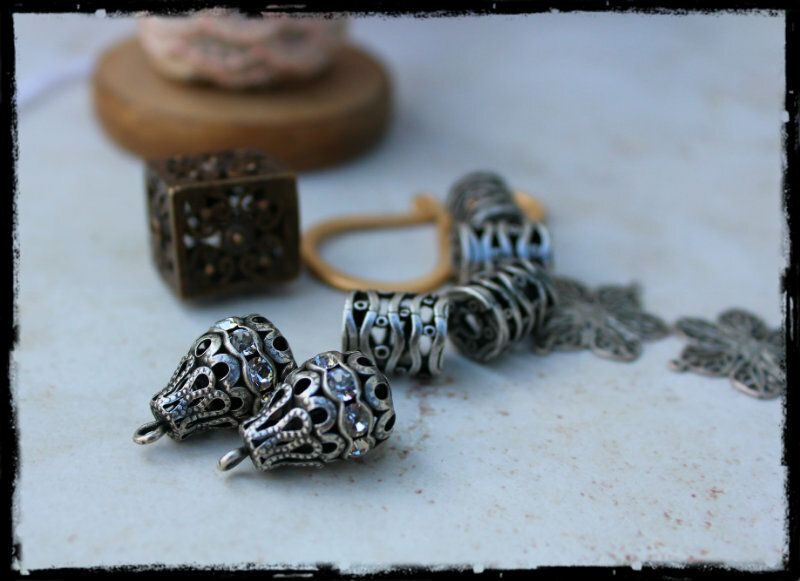 Beaded components such as open circles/squares/triangles that could be easily incorporated into a design. It'll be my 3rd BSBP ... can't wait! Even though I participated in the last BSBP, going through and reading this article gave me some ideas and definitely taught me a few things! Love the BSBP and Lori you put all the do's and do not's perfectly. I forget how many of these I have done but I love each and every piece I have made and can't wait for the next one. I am going to do my first swap! I can't wait, such a great idea. This will be my first BSBP. 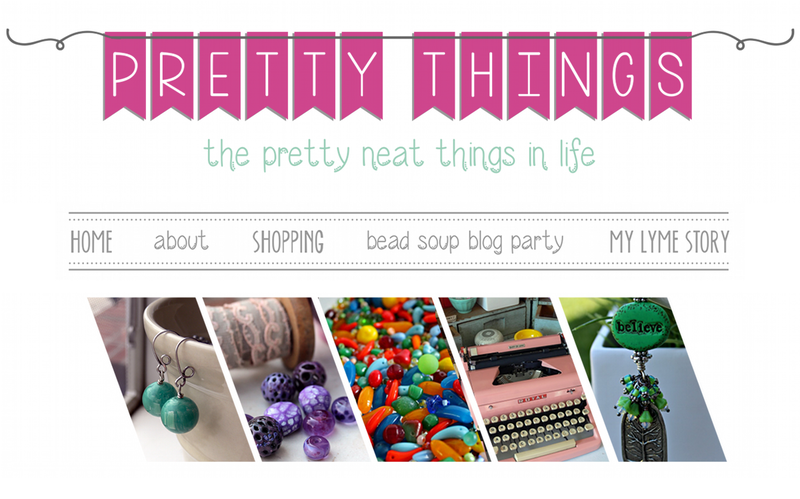 or you can contact me through my blog http://homeofthepurskey.blogspot.com. Thank you in advance for helpful advice and suggestions. I look forward to hearing back from someone. I cannot wait to sign up! Thanks for making the distinction between seed beaders and others. I LOVE seedies but I've never been able to do anything with them (I go blind trying to do weaving) so I look on in awe of the wonderful stuff put together with them. I am a seed beader and your advice is good. I would note that seed beads can be strung. If sending seed beads to a non-seed beader send a threaded needle as well. Thank you so much for the details and pictures. As a first time souper I'm not so daunted. Also, it is great to know that the soup can be pre made ahead of time. 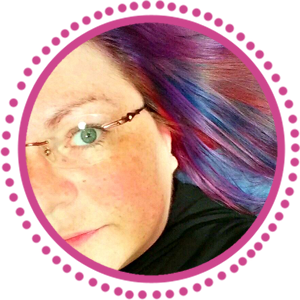 I am going to take the challenge just to see what happens and to get me off the couch and into the creative corner. I can't wait!!! And I too am going to see what I can "cook" up in my bead room, kind of stuck on kumihimo but my partner is sending me info on wire crochet......what to do, what to do! This will be my second go around and I'm sure ill do better this time! Looking forward to my first exchange-living in a small community means I have very limited contact with other beaders. Hope this will add to my experiences - only in the best way, of course!